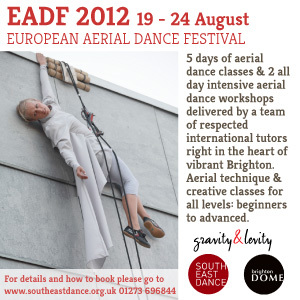 The 3rd European Aerial Dance Festival hosted by Gravity & Levity will run for 6 days this year from August 19th – 24th Supported by South East Dance, Brighton Dome and Festival and the Arts Council of England (we hope!) All classes will take place at the Brighton Corn Exchange, right in the heart of this vibrant city. Aerial technique and creative classes will be taught for all levels from beginners through to advanced on the Mon – Friday delivered by a team of experienced, highly respected (and very friendly) international tutors. On Sun 19th there will be a choice of 2 all day workshops: an inclusive aerial dance workshop (all levels) and a creative fabric lab for advanced aerialists.